So, we are at a dinner party and my friend Bob asks me what is my favorite thing before dinner. I think he was talking about drinks, but my mind wandered. Since it was mixed company, I couldn’t really discuss my most favorite thing before dinner. As I broke out of my reverie, pleasant as it was, I recovered quickly and responded that I really appreciate some quiet time before dinner to enjoy a good glass of wine (or vodka) without having a lot of last minute cooking chores. I mean, sometimes it is fun to have a crowd in the kitchen all working on a meal, but it is also pleasant to have a dinner party where you can easily spend time with your guests. Braised beef short ribs are a perfect solution. In terms of an easy dinner party, this dish is similar to Beef Bourguignon, Coq Au Vin or Jambalaya – it can go from oven to the table easily and quickly. 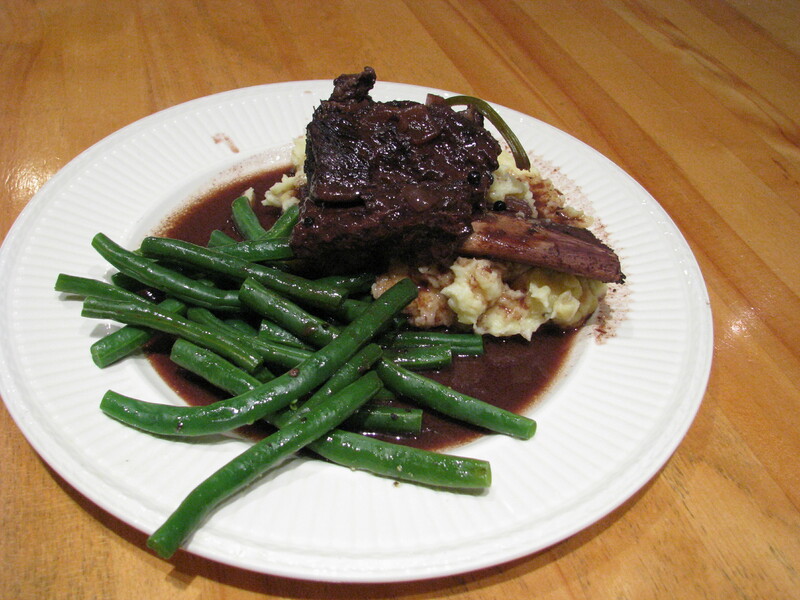 Braised beef short ribs are a true American classic dish. It is uncommon in France, Italy or the UK. 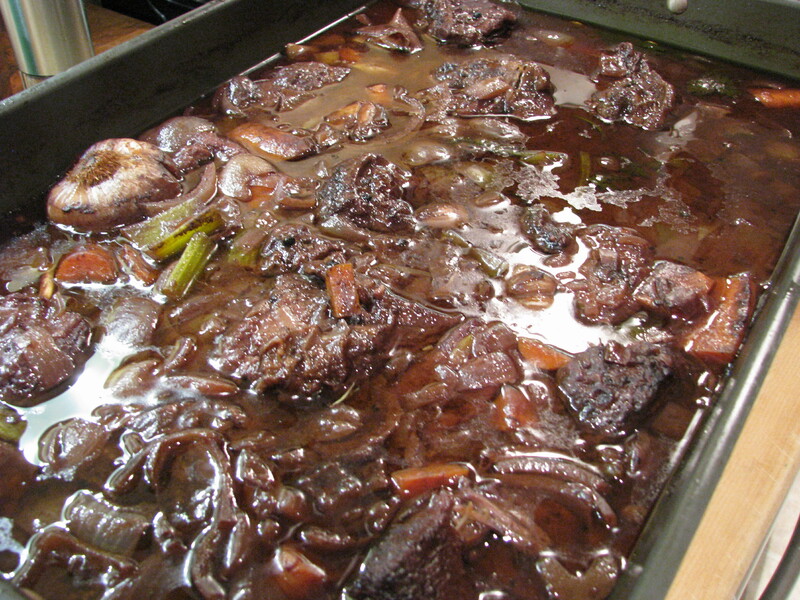 – hardly a mention of it in any of the European cookbooks – Julia only mentions short ribs as a cut of meat. If you really think about it, ribs – both pork and beef – are really an American thing. The recipe below is perfect for a dinner party for eight. But, it is easily scalable and leftovers are great. So, divide it in half if you’re looking for a romantic evening with that special person, or double or triple the recipe if you are having a gala and have a big oven. It is also a relatively easy recipe – it takes under one-hour to put together and get in the oven. The biggest problem is finding the right sized roasting pan. You need something that has at least three inches of depth, because you need to submerge the ribs in the braising liquid. I like the Cuisinart CSR-1712R 17 x 12 x 3.6 Inch Roaster with Removable Rack. 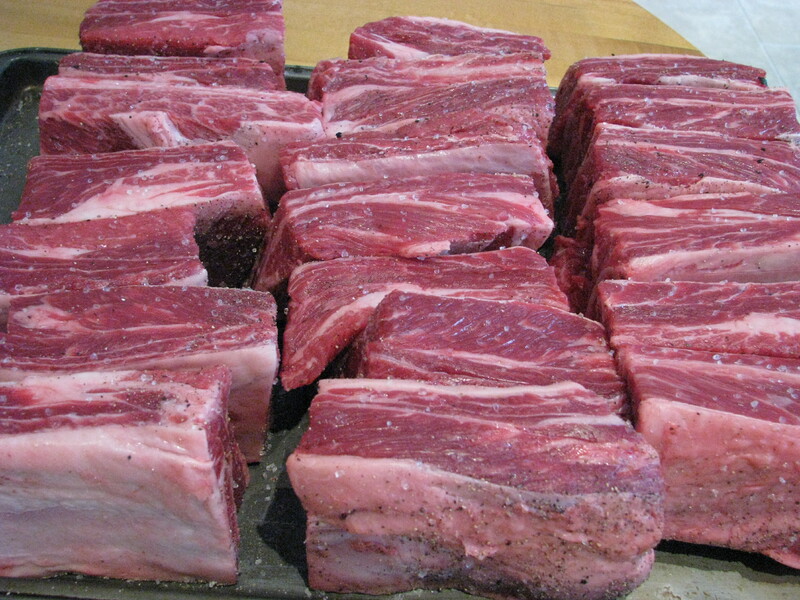 It will easily hold 8-10 short ribs. Costs about $30. Some of the ideas for this recipe come from Chuck Hughes (try “Chuck’s Day Off” on The Cooking Channel, which is a great program, or go to www.cookingchanneltv.com/chucks-week-off/index.html). He is the only one I know that uses cocoa powder, brown sugar, whole peppercorns and cinnamon in the braising liquid. 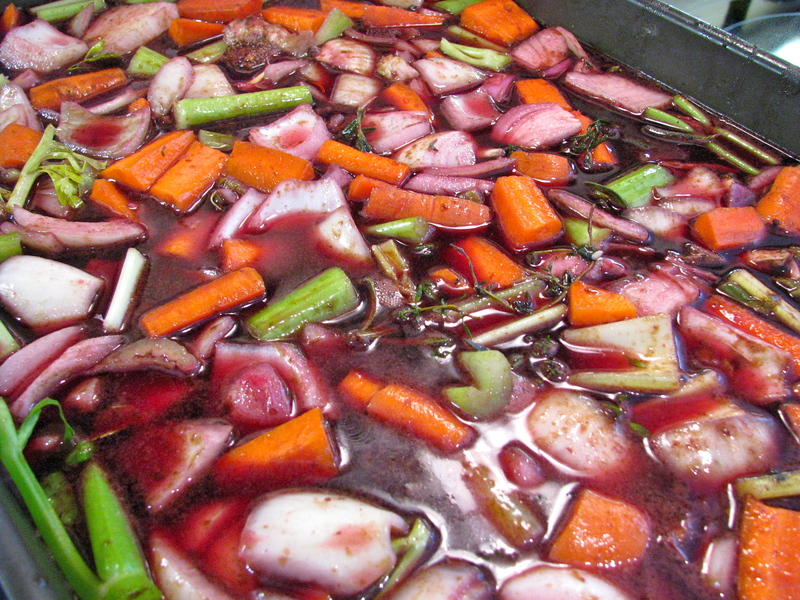 The braising liquid itself is red wine that is reduced to about one-half. Chuck’s special ingredients produce a thick sauce with sweet overtones of chocolate, pepper and cinnamon. Typically, the dish is served by placing the ribs, one or two per person, on a bed of mashed or smashed potatoes, over which you pour a healthy quantity of the reduced red wine sauce. It doesn’t get much better than this. Mix the salt and the flour in a shallow bowl. Heat the oil in a large skillet or saucepan over medium high heat. Pat the ribs dry, dredge in the flour and salt mixture and brown for two minutes on each side. Using a fork, hold the ribs upright and brown the edges for a few seconds. Arrange the ribs in the roasting pan. Deglaze the skillet with some of the wine and pour over the ribs in the roasting pan. In a mixing bowl, take some of the wine and mix with the cocoa powder and brown sugar. Pour over the ribs. Cover with aluminum foil and braise in the oven for four hours. Remove from the oven and set the ribs on a warm plate and cover with aluminum foil. With a large slotted spoon or a colander, strain the sauce and discard all of the vegetables and herbs. You now want to reduce the braising liquid to about one-half. 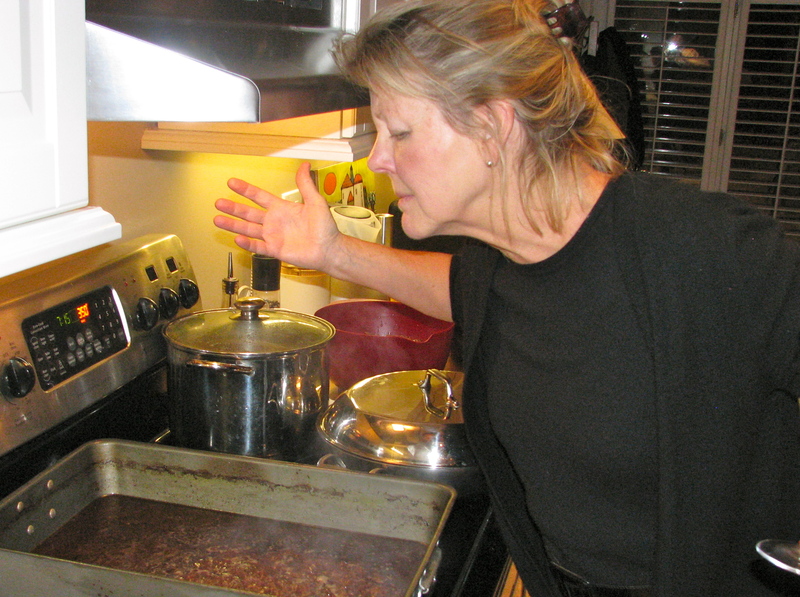 If your stove or cooktop permits, leave the liquid in the roasting pan and reduce. If not, transfer to a large saucepan. It will take about 20 minutes to reduce. Once reduced, add the butter, stir well and return the ribs to the pan to warm. Cut the top off the two heads of garlic, wrap in aluminum foil and put in the oven beside the ribs for one-hour. Take out and let cool. When the ribs are about finished, add one tsp. of salt to about two quarts of water and boil the potatoes until tender – about 15-20 minutes. Drain the water and leave the potatoes in the pot. Squeeze the soft garlic into the potatoes. Cut the butter into pats and add to the potatoes along with the half and half. Smash the potato mixture with a hand masher. Add salt and pepper to taste. You want to end up with chunky, garlicky end product. Serve by placing one or two ribs on top of a bed of potatoes and topping with a generous portion of the reduced red wine sauce. Pair with a green vegetable such as Brussels sprouts, broccoli or green beans. There will be little conversation at the table – everyone will be focused on eating this marvelous American classic. Eager to try this one! It is the pefect winter comfort food. Is it possible to do any of this the day before? You can braise for three hours ahead of time, refrigerate, and then braise for another 1.5 hours when you are ready to serve the dish. Don’t make it more than two days ahead of time. It will be just fine.